Not even going to lie. When the thought of becoming an interior designer came along and when I actually began doing it, I thought certain things were pure common sense. Things like where to place specific items in the home, for example. Though the more I push my creativity, the more impressed I get with the possibilities. This brings us to hardware placement. Guys, hardware can literally be placed however, wherever you want. Sure there are a few obvious placements and practicality must be kept in mind, but I always encourage change and innovation. Wish I had that today. HA! Instead, we're sharing classic placements for cabinet hardware, including for kitchen, bathroom, or built-in cabinetry. 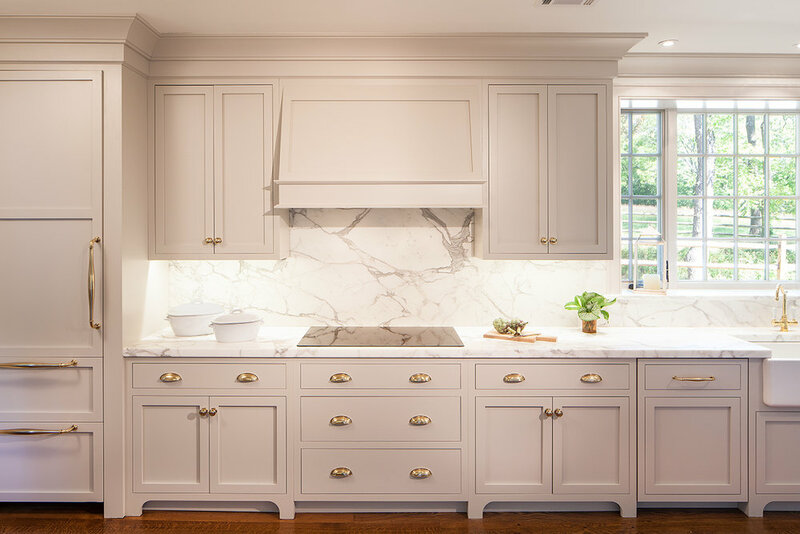 This kitchen designed by Robert Rhodes Architecture + Interiors features inset cabinetry and a mixture of knobs and cup pulls placed in both a traditional and modern way. What we think is the dishwasher, has a cup pull placed on the "rail" (horizontal strip on the frame) of the cabinet frame. Upper cabinet knobs are placed on the bottom right hand corner of the face frame and for base cabinets, knobs are located on the top left hand corner. When working with shaker style cabinets, place knobs 2 1/2" inches away from the edge of the frame (view example below). Ideally, specially if you are designing your kitchen from scratch, we suggest inset cabinetry where drawers and doors close completely flush with their cabinet face frame opening. This style offers a seamless and clean look to cabinetry. If your cabinetry is inset, do you consider the width of the drawer or the actual width of the cabinet (stationary frame and all) when deciding on the length of your pull? We suggest you simply go by the width of the drawer because viewing the installation, you'll notice the tiny gaps created, which delineate a drawer, so it would be best if the hardware is centered within this frame. Consider 2 knobs for drawers that are 24" inches or wider. When installing them, divide the width of the drawer frame into thirds and then place each knob to the left and right marks. In shaker style cabinets, note that you may place a knob within or outside the frame. When installing knobs on the corner of the face frame for shaker style cabinets, leave 2 1/2 inches of space between the top (for base cabinets) and at the bottom (for upper cabinets).